West Orange, New Jersey, started out as a small settlement in 1681 when roads connecting it to a larger settlement on the banks of the river Passaic were built. The earliest name given to the settlement was Mountain Society and was changed to Orange in 1806. West Orange came into existence when the city of Orange was divided into two parts. West Orange gained official recognition in the year 1863, and today is known for its cultural events, parks, stellar educational opportunities and as the home of Thomas Edison. Indeed, the museum dedicated to the inventor is among the city’s top attractions and offers memorabilia, photos, and other artifacts related to Thomas Edison. People looking for entertainment and recreation opportunities will find many here. For example, you can visit the Turtle Back Zoo, where you can watch sea lions, penguins, leopards and other animals. You can also choose to spend a day at the golf courses located close to the city, including the courses at Montclair and the Crestmont Country Club. The area also boasts an eclectic arts and culture scene maintained by organizations such as the West Orange Arts Council which hosts interest groups, art exhibitions, and theater and art workshops. Adding to the appeal of the community, particularly for families, there are more than ten schools serving the area. For residents, the easy access to the major cities is one of the best reasons to live in West Orange. Furthermore, the Newark International Airport is less than 15-miles away, while New York lies less than 20 miles from West Orange. The local train stations connect the city to other cities in the country, as do buses, and a shuttle service connects the train station to major locations in the city. As far as residential housing options are concerned, there are numerous properties available in West Orange, ranging from colonial style mansions to brand new condominiums and apartments. 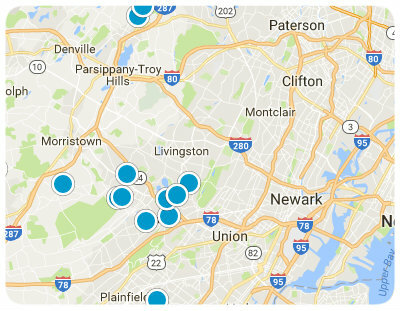 Homes for sale in West Orange come in a broad price range sure to accommodate most homebuyers’ budgets. If you would like to learn more about available real estate in West Orange, New Jersey, please allow us to assist you and contact us today.